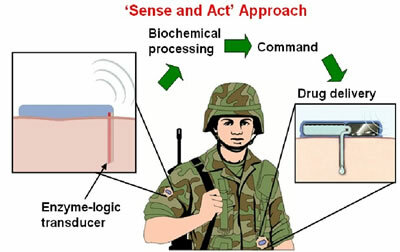 An automated field hospital on a chip worn by troops as part of their uniforms will monitor a soldier's health, and if necessary, dispense appropriate medication. 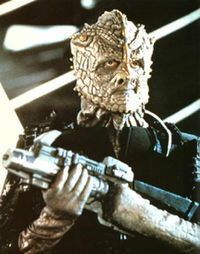 Fans of Star Trek: Deep Space Nine may recall the Jem'Hadar, shock troops for the Dominion. The only nourishment they require comes in the form of the hormonal enzyme Ketracel White (or simply "[the] white"). Without this drug, Jem'Hadar go into severe withdrawal, resulting in loss of cognitive and motor functions. They will lose their shrouding ability and regress into a highly aggressive stage, not discriminating in who or what they attack, including their Vorta superiors and peers. Lack of white will eventually kill a Jem'Hadar. The Founders use the Vorta to supply the Jem'Hadar with the white. It is administered through cylinders that fit into a system near a Jem'Hadar's collar, which is then fed directly into the Jem'Hadar via a tube running into the carotid artery. I should also reference the Powered Suit with Trauma Maintenance from Joe Haldeman's 1974 novel The Forever War. "Then "trauma maintenance" cauterizes the stump, replaces lost blood,and fills you full of happy juice and No-shock..."
Thanks to Moira for pointing this story out; from UCSD press release.